Ohio’s Madonna of the Trail monument in Springfield. Ohio’s Madonna of the Trail monument was the first monument to be dedicated in 1928, and it may have been the most moved of all 12 monuments since it was first placed. This monument is owned by the Lagonda Chapter of the Daughters of the American Revolution in Springfield (DAR chapters own all of the monuments). 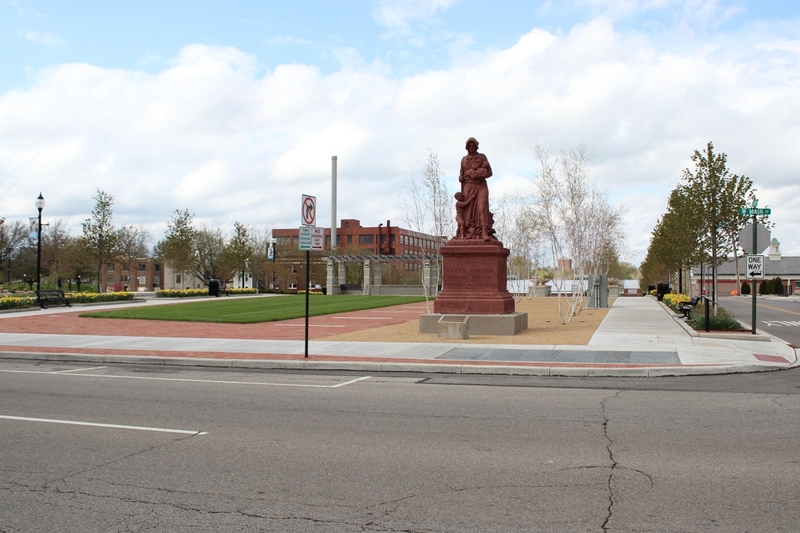 Currently, the monument is along Main Street in downtown Springfield’s relatively new National Road Commons park. Originally, according to the city of Springfield and the DAR, the statue was along present U.S. 40 on the grounds of the Ohio Masonic Home, west of downtown Springfield. However, when the U.S. 68 bypass around Springfield was being built (1957), the monument was moved out of the way and onto an alcove along U.S. 40 slightly farther east. That location seemed to be pretty unfriendly to visitors, as it appears there wasn’t really anywhere to park, and that section of U.S. 40 is four-lane with a speed limit of 50 mph. The monument was last restored in 2003. Finally, in 2011, Ohio’s Madonna was moved a few miles east to its present location in a new park. Finding the statue was pretty easy. The National Road Commons takes up part of a city block between West Main Street and West Columbia Street two blocks west of Ohio-72. Parking along the street is not an issue. 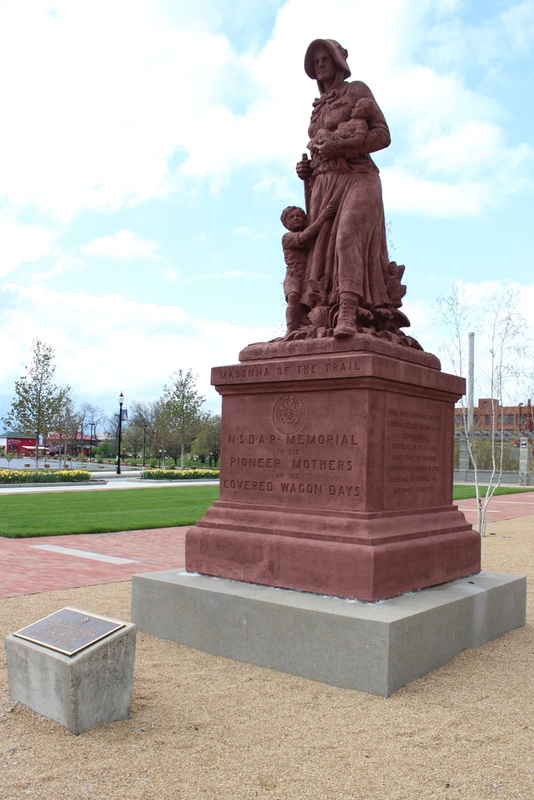 The monument was placed in Springfield’s new National Road Commons park in 2011. Like each of the 11 monuments that came after this one, Ohio’s Madonna is identical to the others (the inscriptions on the pedestals do change though, to reflect local history). Madonnas along the National Road are located in Beallsville, Pa.; Wheeling, W.Va.; Richmond, Ind. ; and Vandalia, Ill. The rest are in Bethesda, Md. ; Lexington, Mo. ; Council Grove, Kan.; Lamar, Colo.; Albuquerque, N.M.; Springerville, Ariz.; and Upland, Calif.
Below is a map showing the travel path of the Madonna of the Trail in Springfield. Note that the first location at the Ohio Masonic Home is approximate. This entry was posted on Wednesday, May 8th, 2013 at 12:00	and tagged with madonna of the trail, national road, national road commons, ohio, snyder park, springfield, us 40 and posted in Clark County, History/Museums, Ohio, Springfield. You can follow any responses to this entry through the RSS 2.0 feed. I’ve seen all but the Springfield Madonna along the NR, and that only because my trip across Ohio was before the Madonna was moved to its present location — and there really was no place to put my car to see it in its previous location. I visited the Madonna of the Trail at the old location in Springfield several times in the past. Most recently, I found that it had been removed to the new location. I spent about 1/2 hour checking out the new location, and in particular the new park. It’s actually very nice and well-done. Although Springfield has experienced a lot of abandonment, decay and tear-down, it’s nice to see something new and high-quality there. I will say that the park, like the rest of downtown, was empty when I visited. No people anywhere. Also, a couple of the blocks around the park were nothing more than empty, grassy lots. I imagine that at one time those empty lots were occupied by houses and buildings. As somebody who lives in the densely populated East, the level of emptiness in decaying Midwestern cities like Springfield is simply amazing to me.